I thought you said, "Pour a glass!" Well, now you heard us right! 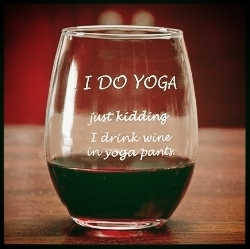 Spend an hour with vinyasa flow on your mat, then spend a hour with "vinoflow" in your glass! All puns aside, a deep, rich and sweaty vinyasa flow class with Simone Romig will get you primed for a little unwinding after class! We will transform the yoga space into your best friend's living space! Music, healthy snacks, lively conversation, and libations aprés yoga! Meet your fellow yogis, mingle with other Anchor Yoga teachers, and make new friends! Pre-registration is required for this soirée. No drop-ins and no class passes. Cost: $20, and you can sign up right here! Simone wholeheartedly believes in the transformative power of Yoga. She is a Hatha Yoga instructor who has been sharing her insight with students for five years. Drawing from her experience in Hatha, Vinyasa and meditation, Simone devotes her energy to helping students realize an array of physical, mental and emotional benefits that derives from Yoga practice. She also helps students concentrate on the evolution of each asana, as well as their own and unique approach to overcoming challenges. Simone assists each student with connecting and identifying with their inner-essence by exploring the tri-sphere (physical, mental and emotional) state during practices. Simone is a 300 hr. Hatha and Kids Yoga Teacher Certified by Aura Wellness Center. Movie Screening: "Escape Fire: The Fight to Rescue American Healthcare"